A delicious love letter to the Gulf Coast's vibrant food culture, by Jimmy Buffett's sister and owner of two beloved destination restaurants in Alabama and Florida. 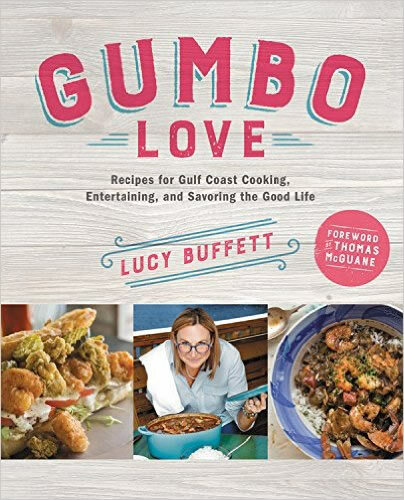 Incorporating Caribbean, Cajun, Cuban, Mexican, Old Florida, and Creole influences, Lucy proves through her collection of recipes that the Gulf Coast has its own distinct flavors and traditions that make it a destination year after year. Surviving hurricanes, the Gulf Coast—beyond just New Orleans—has a vibrant food and culture that's gone largely unnoticed. Lucy wants to change that by sharing her food and stories with GUMBO LOVE readers. Like her brother, Jimmy, Lucy celebrates freedom, relaxation, and seaside decadence in her own art--cooking, and has now written the cookbook her fans have been asking her for; one that offers the recipes she's famous for, along with Gulf Coast classics and stories of growing up in Mobile, Alabama, working in New Orleans, and her philosophy of relaxation, gratitude, and enjoyment. Lucy combines over one hundred new recipes with old favorites. Her fans will find recipes for their social occasions including gumbos, main dishes, deep fried favorites (with her easy frying tutorial), salads, seasonings, libations, and desserts. They will also learn how Lucy navigates the kitchen, her business, and her family and readers will come away with the basic ingredients of an inspiring life philosophy.